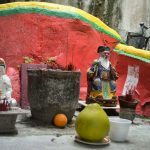 Exploring the outlying islands is chance to catch a glimpse of Hong Kong’s village life. A shift from urban to rural landscape brings out its contrasts again and surprises with a wide range of attractions and places to discover. 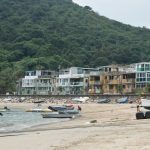 As the largest outlying island, Lantau Island is a very popular tourist spot but it also has some more quiet and reclusive areas. Although it is possible to reach the island by MTR and then a cable car I opted for a ferry ride from Central. 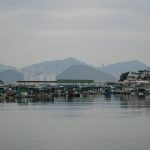 Getting around by ferries was my thing while in Hong Kong so I was just swiping in and out my Octopus card (a bit like London’s Oyster card) and hopping from one place to another. 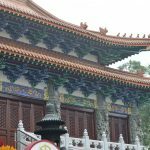 Lantau Island is famous for its Big Buddha and the Po Lin Monastery. 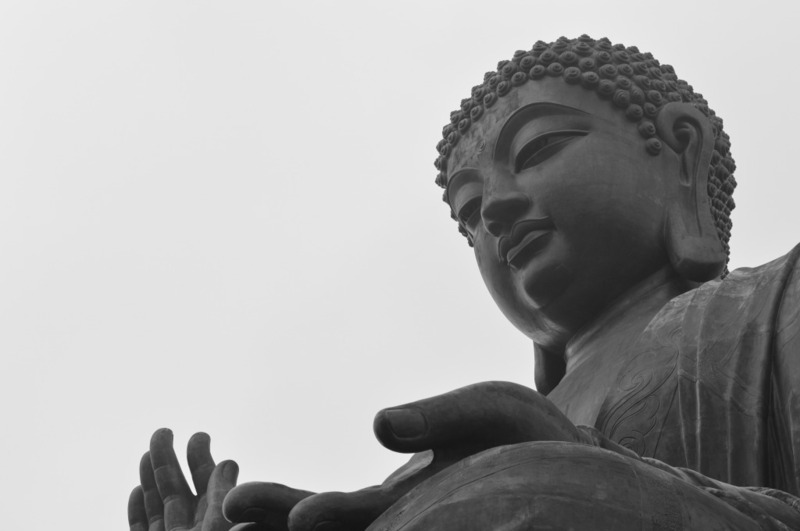 I was lucky that I arrived before the clouds surrounded the large statue but not so fortunate to enjoy the Wisdom Path. 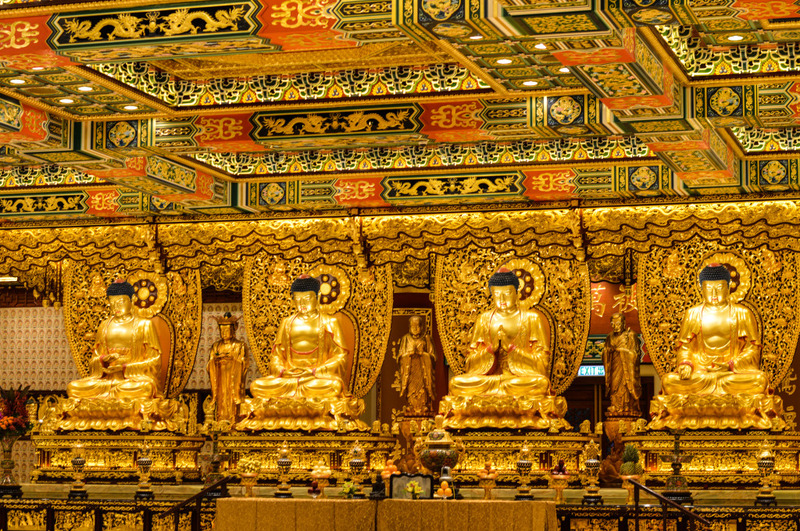 As the fog appeared from nowhere within couple of minutes and it was difficult to walk around I visited the Po Lin Monastery with a stunning Grand Hall of Ten Thousands Buddhas. 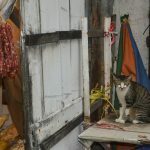 Afterwards I had a quick vegetarian lunch at the Monastery and I suggest that you take some snacks with you as the meal on offer was a bit of a letdown. 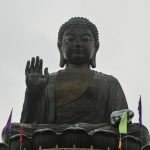 No worries though, Ngong Ping Village is just round the corner from the Buddha statue and it is full of shops and eateries – you will not be hungry! It is worth mentioning that if you have a stopover at Hong Kong Airport or a few hours to kill before your flight you could also hang out there. The airport is situated on the same island and it not difficult to find your way or a luggage locker if you want to get into more practicalities of this idea. The weather slightly spoiled my hiking plans. 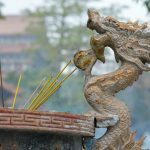 Lavinia, a friend who I met when travelling in Vietnam, shared with me few tips when I was planning my trip. 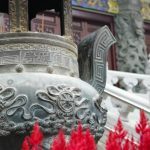 She lived and studied in Hong Kong for a while so her recommendations were priceless. 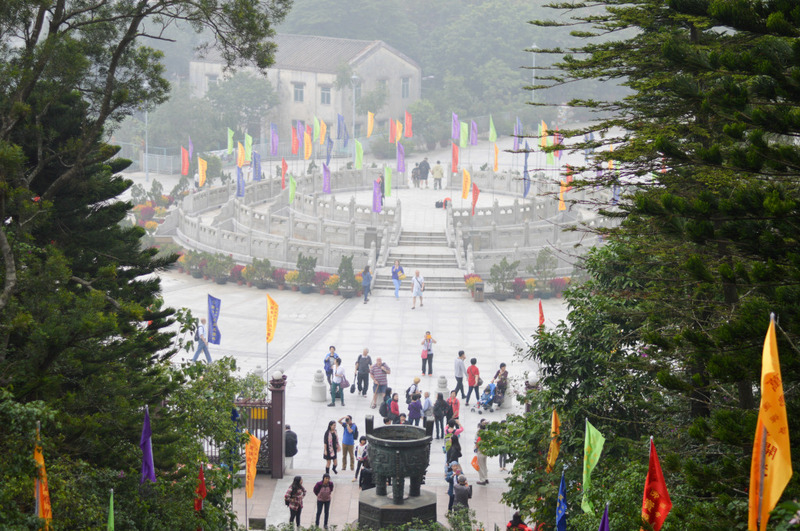 I wanted to hike to Man Cheung Po’s infinity pool as she suggested but the rain and fog made me change my plans. 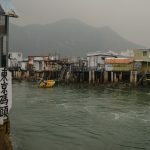 I made my way to Tai O instead. 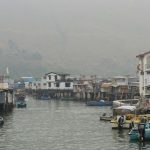 A small fishing village with stilt houses was also an interesting place. 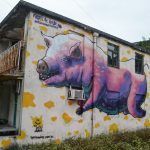 I did not want to give up my hiking hopes so when the weather improved I decided try my luck with Lamma Island, the third largest outlying island. 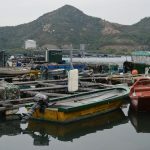 I planned a fairly easy hike, taking me from Sok Kwu Wan through the beaches, a hill from which I could see the other islands and the power station all the way down to Yung Shue Wan. Not bad for a 30-minute ferry ride from Central! You could reverse this route and finish in Sok Kwu Wan. This tiny village is known for its seafood restaurants. Why not end your hike with a delicious lunch? This small island preserved a lot of its rural charm. 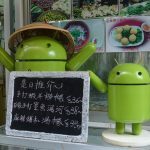 It might not be at the top of the list of places to visit in Hong Kong for many tourists, however it has more authentic and local feel. 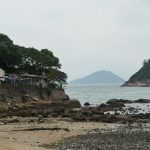 When the noise of Kowloon is becoming too much the places like Peng Chau Island are perfect to just sit down on a beach or grab a coffee with friends. Believe it or not there is a French café there. Les Copains D’abord. Right on! What a name… I have nothing else to add. 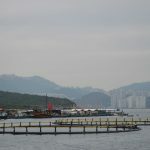 Nice photos, love the HK outlying islands. 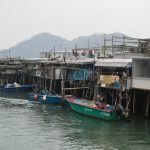 Next time you should check out Cheung Chau Island , its a great small community with a nice local vibe! Thanks Josh – will do! Cheers for the tip.